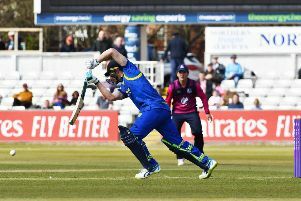 Durham clinched the final qualifying spot in the NatWest T20 Blast North Group after edging out fellow contenders Derbyshire by 13 runs. Mark Stoneman and Calum MacLeod shared Durham’s record Twenty20 stand of 141 as the hosts amassed 193-2 after being put into bat at Chester-le-Street. Paul Collingwood’s men will now visit Gloucestershire in the quarter-finals on Wednesday, August 10. The total proved beyond Derbyshire, despite Neil Broom’s 68 from 43 balls, and victory gave Durham fourth spot as they leapfrogged Warwickshire, who were beaten by Lancashire at Old Trafford. Both teams went into the match knowing a win would see them through to the knockout stages and Durham’s hopes were boosted by Stoneman and MacLeod’s efforts with the bat. Stoneman batted through the Durham innings for an unbeaten 82 off 56 balls, with eight fours and one six, while MacLeod’s 83 came off 50 deliveries and included three maximums. Stoneman hit four fours through the off side in the first three overs, two of them in the third as Ben Cotton conceded 14. Keaton Jennings, taking Phil Mustard’s place at the top of the order, also began to find the boundary in a stand of 48. Stoneman, on 23, survived a steepler to Neesham, backtracking from mid-off, in an eventful sixth over from Shiv Thakor. Jennings followed up by twice driving the medium pacer down the ground, but when he tried for a third wide of mid-off Chesney Hughes flung himself to his right and held a sensational catch. Jennings’ exit halted the boundaries until MacLeod hit the last two balls of the 10th over for four and six. He swept Wes Durston’s off-spin behind square then lifted him over long-on to take the score to 89 at the halfway mark. Thakor conceded only six runs in the 16th over, but then went for 17 in the 18th, leaving Neesham with the best figures of 1-25 after conceding only seven in the final over, when he also had MacLeod caught at short fine-leg. Derbyshire lost Hamish Rutherford for one in the first over, when he pulled straight to midwicket as Chris Rushworth picked up 2-14 in three overs. His other victim was Hughes, who chipped the first ball to midwicket. The visitors were up with the rate while skipper Wes Durston was making 44 off 26 balls, but when he was third out in the eighth over they lost momentum. It looked too tall an order by the time Jimmy Neesham holed out at long-on for six with the visitors requiring 99 off the last eight overs. Thakor revived hopes with three sixes off the spinners in making 26 off 10 balls, but once he had skied Scott Borthwick (3-33) to cover, it was as good as over. Although Broom showed his class, Derbyshire threw wickets away in desperation and slipped to 150-8 before debutant wicketkeeper Alex Mellor, on loan from Warwickshire, helped to put on 26. However, Broom was well caught by MacLeod at long-on in the final over and Derbyshire finished on 180-9.